"Please click "Multimedia" for 3D tour! Stunning, fully developed 2 storey work of art in VERY desirable West Hillhurst! This executive home features: chef's kitchen with gas stove/wine fridge/butler pantry/pot-filler faucet, amazing curved staircase, built-ins throughout, 3+1 good sized bedrooms, towering 2 storey feature wall/bank of windows, theater room, beautiful wine display, oversized/insulated double garage, 2 staircases to walkout basement, deck & lower patio, staircase to future rooftop patio, A/C, custom lighting package second to none, chic master suite with air massage tub/large shower with chic "tile-top linear drain"/large walk-in closet, Smart Home system, TRIPLE pane windows, 2-zone in-floor/in-slab heat in basement & MUCH more! 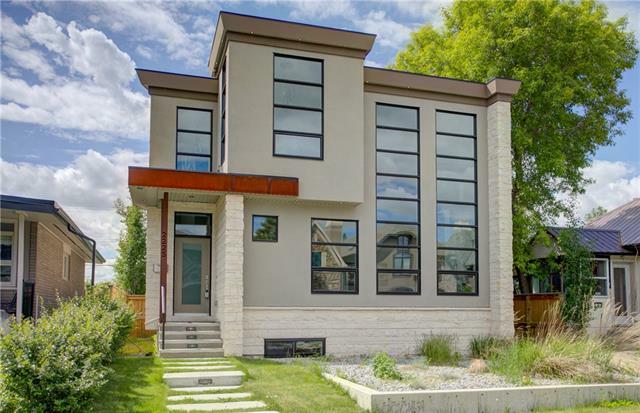 Location is perfect - backing onto Broadview Park, views of Bow River & DT, 10 min walk to DT & Kensington, 2 blocks from Bow River Pathway & very easy access to Crowchild & Memorial Drive. This 2014 SAM Award winner will not disappoint! IMMEDIATE POSSESSION!"